Meditation can help your brain become more mindful and conscious, creating stability, clarity and emotional balance. LIKE A WORKOUT, meditation has its good days and its tough ones. Some days when I meditate, I spend much of the time making lists, hoping desperately I’ll remember them by the end of my 15 to 20 minutes. Sometimes, I can barely sit still. Some days, I feel calm. I spend more time focusing on my breath than distractions. Like a physical workout, no matter how it felt during the activity, I always feel better afterward. Meditation is a training ground for your brain to become more mindful and conscious, creating a more stable and clear mind and emotional balance, according to a Scientific American story on meditation. 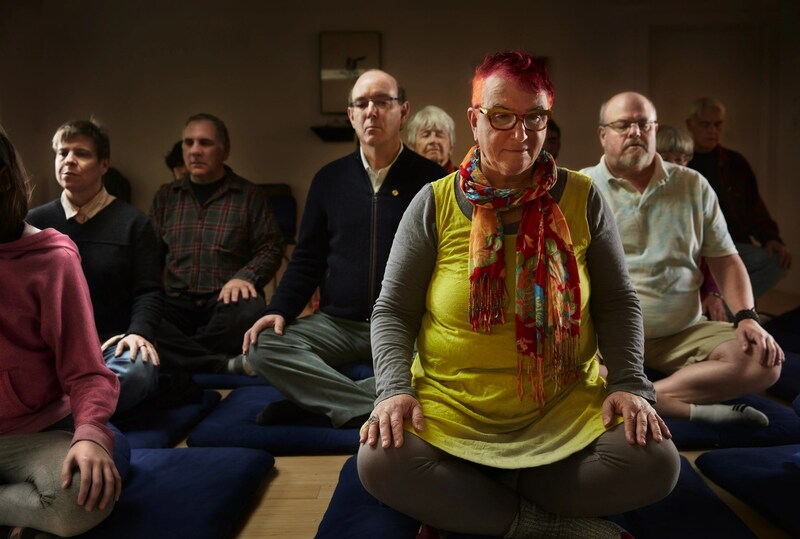 The Shambhala Center teaches a mindful awareness meditation rooted in the Buddhist tradition that is based on awareness of your body and your breath. The technique is simple and easy for people to learn, Gaylord says, though it is hard to maintain for long periods of time. Thus, the training. Like exercising a muscle, “Every time we come back to the present, we are increasing our mental strength,” he says. Meditation has been shown to reduce anxiety and stress, and lead to more empathy, cognitive ability and an improvement in memory. A Harvard study showed that after eight weeks of mindfulness training, people’s brains showed a decrease in density in the amygdala, known to play a role in anxiety and stress. As you become more aware of when you are present and mindful, self-awareness arises, Gaylord says. Similar to lifting weights or exercise, the more you work out, the more you understand your body, from its limits to what feels right. You apply the same technique to your mind. “We learn about ourselves as we practice,” he says. With any activity that requires discipline, I require some of it to be fun or to feel like the outcome is valuable. Gaylord concurs. You can’t meditate because your doctor told you to do so; you have to experience it for yourself. Think of it this way: When you’re busy, driving to work, dropping off kids or answering emails, your day doesn’t often allow much time to notice whether you’re present. Everyone is present at some point during the day. The first step is to ask yourself whether you know when you are present. Get curious, Gaylord says. Sitting in meditation gives you the space to ask the question and observe the answer. You might see as you meditate that your emotional reactivity goes down. You might be less inclined to yell at someone in traffic. In turn, you are less emotional, and less exhausted. You can do a better job at work or be more satisfied in your work, or in your life, he says. As you return to your schedule from the holidays, you also might have experienced intense family interactions or stress. A meditation practice can support you in noticing whether a sibling pushed your buttons, or whether it caused a reaction and perhaps a blowup. Being able to see that chain of events is helpful, Gaylord says. The new year also is a great time to establish new practices, such as attending a meditation class at Seattle Shambhala or other local meditation centers. But really, “Anytime is a good time to start a practice,” Gaylord says. Nicole Tsong teaches yoga at studios around Seattle. Read her blog at papercraneyoga.com. Email: papercraneyoga@gmail.com. Benjamin Benschneider is a Pacific NW magazine photographer.